A typical high school setting. Average shounen-style art. Haikyuu!! seemed like just another slice-of-life sports anime — or so I thought. For a long time sports anime meant basketball or soccer. Recently, the repertoire of sports grew to include baseball, swimming, and in this case, volleyball. Although the sport is different, the sequence of events is usually similar across all such anime — the main character is a prodigy and his team is destined to be the ultimate champion. Haikyuu! !’s most attractive quality is its defiance of these norms. 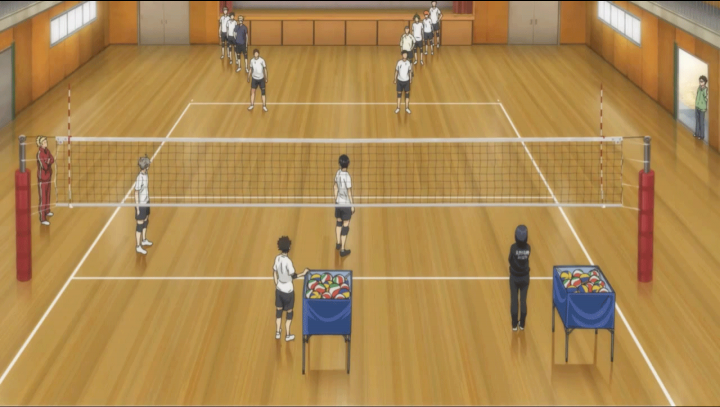 The main character, Hinata Shoyo, is not extraordinary and his team, the Karasuno High Volleyball Club, is not the best. Players don’t have superhuman, exaggerated abilities. On the contrary, Haikyuu! !’s world is very ordinary and comparable to a real world high school volleyball team. So I was eager to watch on to get a glimpse of what sports life is like from my volleyball-playing friends in Haikyuu!!. As Forrest Gump puts it: “Life is like a box of chocolates, you never know what you’re going to get.” The beginning episodes of Haikyuu!! echo this statement with unconventional characters and a fresh plot that is uncommon in sports anime. Each character is unique with identifiable personalities beyond just their varying volleyball skills. With the arrogant setter Kageyama, boisterous spiker Tanaka, and strict captain Sawamura, the Karasuno High team is full of fun and energy, making watching them all the more enjoyable. Similarly, the types of situations the members get thrown into are often different from other sports anime, bringing a new sense of anticipation. For instance, although Hinata and Kageyama were rivals in middle school, they are suddenly forced to learn to work together as members of the Karasuno High team. In most other sports anime, they would have traced the growth of these two separately as they continue to battle it out. What really stood out to me about Haikyuu!! in these episodes was the absence of supernatural skills. I’ve seen many sports animes and have yet to come across one where the players’ skills are actually plausible in the real world. Haikyuu!! is the exception. Hinata may have the unique skill of being able to jump higher than most, but it’s not like he can reach the ceiling. In fact, his jumping skills just bring his short stature up to par with the other players. The closest to a genius-like player is Kageyama, but even he can’t make plays that are impossible to recreate in real life. At first, I thought Haikyuu!! might not be as interesting without the individualized superpowers typical to a sports anime. To my pleasant surprise, this exact quality made the anime feel more grounded and personal. While watching these episodes, I often felt that the Karasuno High team was a parallel to my neighborhood high school sports team. The team goes through various struggles that a high school sports team in real life could very well go through. Karasuno’s former ace player, Asahi, quits after losing his confidence due to a complete shutout. The libero (defensive player), Nishinoya, leaves shortly after, showing how one teammate’s departure can influence other players and the team’s morale overall. Haikyuu!! also accurately depicts sports life through the selection of the starting line-up, which is a key challenge for the coach. The anime shows the difficult decision-making Coach Ukai went through in picking players for their skills over his own sentimentalities. Is it better to go with a third year who knows the team well, or to utilize a freshman’s natural game sense? 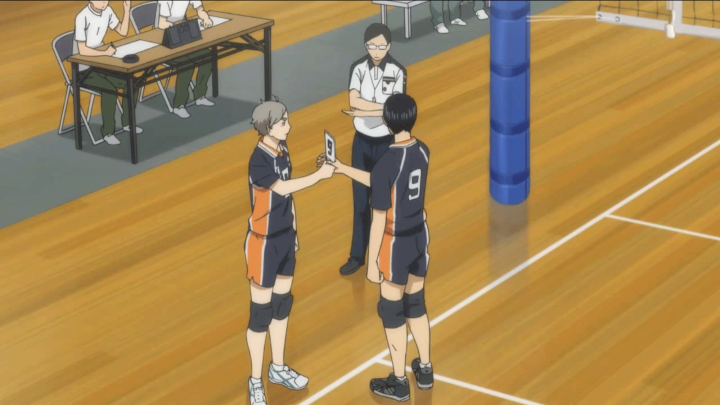 It’s the little details like these that really make Haikyuu!! delightful to watch by associating the characters and the team to our own lives. In most sports anime, scenes set during practice are hard to come by, and even then it’s rare to see players truly working hard like real athletes do. Beyond the realistic struggles Haikyuu!! presents another common theme of hard work. All players have to train hard to achieve their goals, even the genius-like Kageyama. 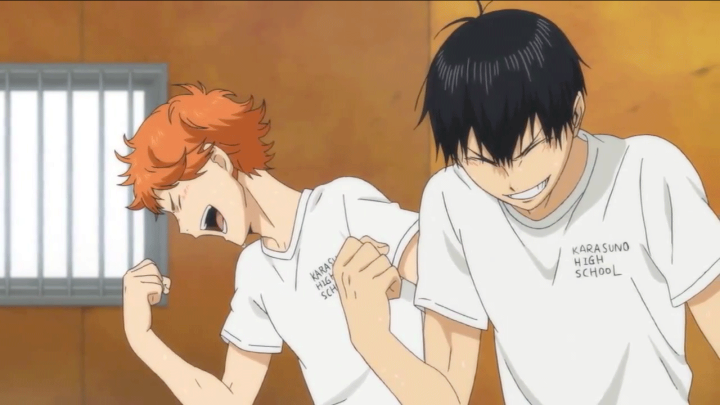 Hinata and Kageyama even take time outside of club practice to work on their quicks (fast-paced spiking) together. In most sports anime, scenes set during practice are hard to come by, and even then it’s rare to see players truly working hard like real athletes do. Haikyuu!! on the other hand devotes most of its episodes not to the actual matches, but to the team’s practice sessions, making the anime much more believable. To my disappointment, these episodes were not as interesting as the last few. Haikyuu!! was starting to feel the same as other sports anime and lost some of its accurate depiction of high school sports. As the inter-high school competition starts, the focus of the anime shifts to the actual matches, making it easier to fall into conventional sports anime cliches. 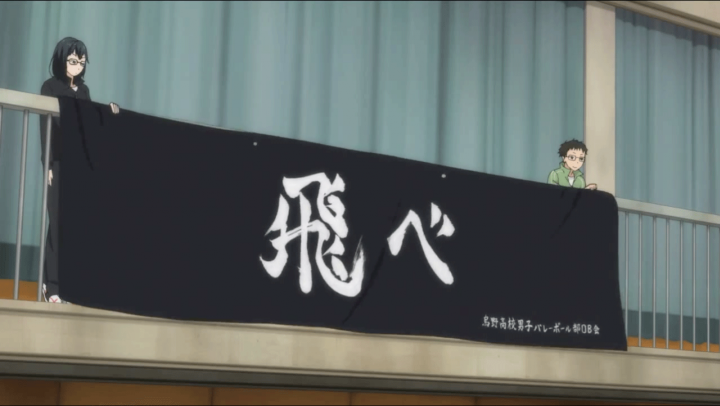 The typical heated rivalry between schools is introduced through the strong Nekoma High that excels in teamwork. While these kinds of rivalries do exist in the real world, the anime emphasized them to the point of being unrealistic. Case in point, most students wouldn’t heat up in anger simply upon hearing the name of their rival school. Another predictable sports anime plot manifested itself through the team from Date Tech. 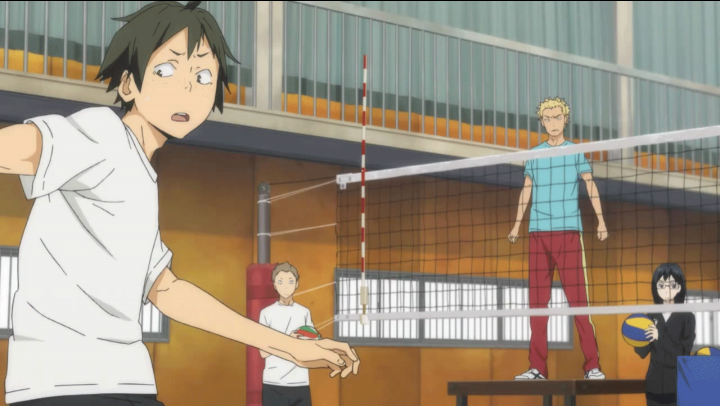 The talented underclassmen of Karasuno High work hard to avenge their upperclassmen’s previous loss to Date Tech. Just like in most other sports anime, the underclassmen, out of respect and sympathy for their hardworking but untalented seniors, want to defeat their enemies and help them finally become national champions. By following these traditions, Haikyuu!! was starting to become predictable and bland. The one saving grace was that these episodes focused on the characters who supported the players — the coach, the parents, and other coordinators in the team. The manager touched the hearts of all the players by enthusiastically cheering them on during the first round of games. Similarly, despite knowing little about volleyball, the advisor did everything he could to support the team including arranging practice matches with top-notch teams like Aoba Josai and Nekoma High. These kinds of support show talented athletes are not the only factors in defining sports. Haikyuu! !’s focus on this aspect felt fresh as other sports animes only slightly touch upon these subjects. 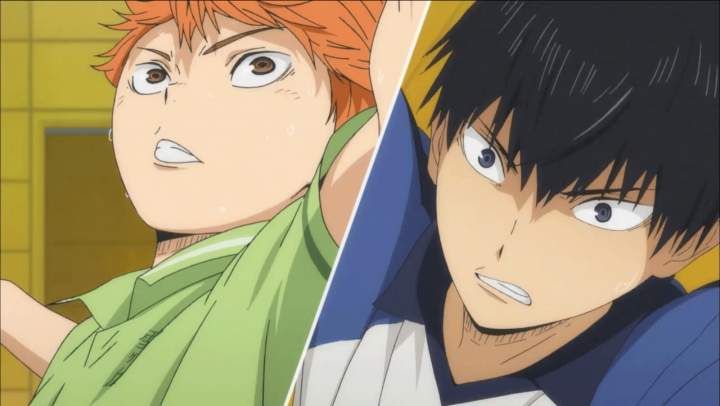 Although the focus of these episodes is still primarily the matches, Haikyuu!! did a better job of keeping me interested by adding unexpected elements. In typical sports anime, the talented few win it all while the less notable teammates are left out of the spotlight. 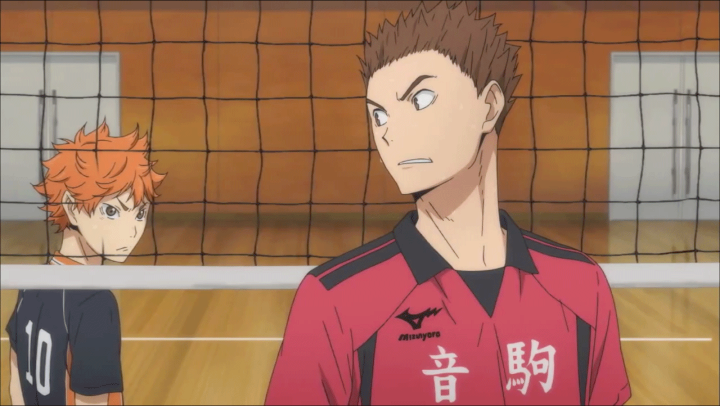 But Haikyuu!! featured the upperclassmen as individual contributors rather than keeping them as just supporting characters. Setter Sugawara is skilled and works exceptionally well with the team as much as his underclassman Kageyama. Even though he isn’t a player with genius game sense, he’s not overshadowed by his “superior” underclassman and actually becomes the focus of an entire episode of the match. In addition, most sports anime spend episodes having the characters feel sorry for themselves after a crushing defeat. But in Haikyuu! !’s case, I really saw how hard the players tried, how devastated they were to lose, but also how they didn’t let that stop them. Rather than dwelling on the defeat like many sports anime heroes do, they realize that it is a natural occurrence in life. With that realization, Haikyuu!! rebounded from its temporary slump with a reflection of the true essence of sports — the will to never give up. Haikyuu!! was good all around not just because it was different from other sports anime, but also because it was relatable. For me, what really made Haikyuu!! shine was its attention to the small details of real life sports that few animes bother to recognize — hard work, struggles, outside support, and ordinary players who don’t have ridiculous names for even more impossible moves. While crazy fantasy situations typical of adventure shounen is fun, an anime that can actually occur in life brings an odd sense of satisfaction — as if you were spiking the volleyball yourself. The upperclassmen who lost to Date Tech aren’t “unskilled” when compared to their underclassmen. They simply lost to Date Tech. Easy as that. Youbact likrbthe seniors haven’t improved at all since their match against Date, so OBVIOUSLY HINATA AND KAGEYAMA are showing them up. You really did try your best to find a cliché. Asahi, Tanaka, and Daichi are all extremely powerful. Stronger spikers and receivers than Shoyo. Only reason he seems so good is because of that demon fast attack he has with Kageyama.